Here is a list of Philhealth Case Rate coverages for Hysterectomy. Hysterectomy is a surgery to remove the uterus or womb. 1. Total hysterectomy is the removal of the uterus and cervix. 3. Subtotal hysterectomy is the removal of only the upper part of the uterus. The cervix is not removed. The fallopian tubes and ovaries may or may not be removed. 4. Radical hysterectomy is the removal of the entire uterus, fallopian tubes, ovaries and pelvic lymph nodes. Other organs or parts of other organs may or may be removed. This is usually done in cancerous cases. 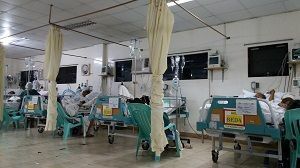 This blog is not administered by Philhealth. It is a personal blog.